Pictured are Naoma Van Brimmer, left, and Lois Jean Weiser, right. BFFs. Most people have a best friend forever, but Naoma Van Brimmer and Lois Jean Weiser truly take the BFF term to the highest level. What a special friendship they have had for 77 years and counting. 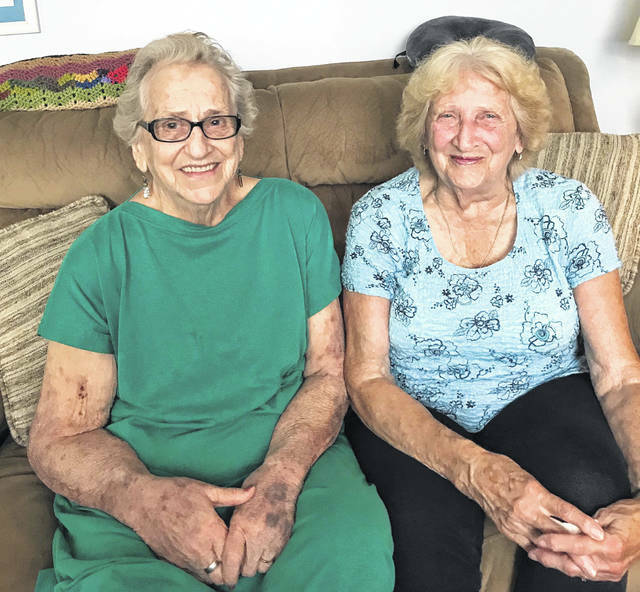 They have been asked many times over the years if they are sisters, and Van Brimmer is just three months older than Weiser. They grew up neighbor girls on London Road. Curtis Street divided them. Van Brimmer hated Weiser’s rooster on their small farm, which would chase her, but it didn’t keep her away from childhood play. Van Brimmer, known fondly as “Poochie,” was nicknamed by her big brother when she was a toddler and it stuck. Hanly Terry and Emery Hawkins, their dads, worked together at Delaware County Highway. They would take all their dolls and go outside to play with them. They would gather catalpa leaves from the trees and make dresses out of the big leaves for their dolls. They walked to Sunday School together on Eaton Street, went to the Strand Theater together for Saturday matinees and would take their allowance and buy doll clothes at the Dime Store where Poochie later got her first job while Weiser worked at Woolworth. Curtis Street divided them from riding the same bus. Weiser would occasionally miss her bus, so she could ride Poochie’s bus. She had her eye on Johnny Weiser, another neighbor who also rode Poochie’s bus. “I always wanted to ride their bus,” Weiser said with a laugh. Fast forward to teen years and Weiser and Johnny were dating, and by then, a guy driving a truck would drive down London Road on a daily work route and noticed this red-haired girl outside. He had his eye on her. “Yeah, Donnie thought I was older then I was, but we started dating,” Poochie said with a warm smile. The four of them would go to The Star Theater. Johnny and Donnie became good friends and life was moving on. “Donnie never forgot seeing Johnny in Korea as he was arriving there for new duty into the unknown, and Johnny was just finishing his tour there. Donnie got a message that someone was looking for him and to hurry because Johnny was about to board a plane back to the states. Donnie never felt so home sick when he saw his buddy, knowing he was leaving and Donnie was coming in,” Poochie said as she reminisced. The BFFs even worked together at Ranco. “When Johnny passed away, it was so hard on Donnie and all of us. And when Donnie got sick, Lois Jean was there for us,” Poochie said. Now stands two strong, brave women, missing the loves of their lives but always there for one another. Fifty-two years of marriage for the Weisers and 60 for the Van Brimmers, they have shared much. Happiness, sickness and health, loves and losses, they find comfort in each other. Sitting at the kitchen table they have shared for years, they fondly reminisce about their young, happy days with Johnny and Donnie. With 53 grandchildren and great-grandchildren among them, they have plenty to chat about. Weiser even has one great-great grandchild. Weiser will pop in with a milkshake or they will have lunch, order a pizza, and their doors are always open for one another. Made from simple things like hollyhocks, leaves from a tree, doll babies and bus rides, long walks, their friendship is like no other. It is golden. Connie E. Curry proclaims humor is the medicine to good health. She is author of “Katie Belle to the Rescue” and “Give Me Back My Glory,” a non-fiction about her journey through breast cancer, which is raw and humorous. Curry has written for numerous magazines and is the recipient of the James Thurber Humor Contest award. She resides in Delaware.